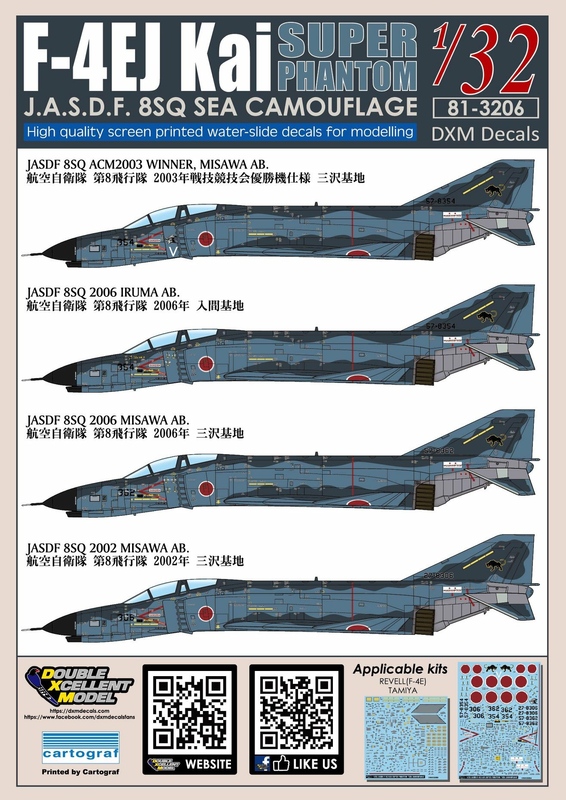 DXM has announced via their Facebook page a new decal sheet for sea camo two-tone blue JASDF Phantoms, release in December 2018. 10 1/32 F-4s completed , and I thought I was out of the Phantom business.. and now this and the Speedhunter E/G sets .. Oh come on guys , give me a break! Anybody selling Tamiya F-4E's cheap? Don't I wish. I'd eventually like the E, J and C/D, with the E being the most desirable right now. These would've come in handy with the "Color My World Blue" GB! That’s great news. I’ve been hesitant to try the dry transfers, especially the tons of stenciling. Nothing on their website yet. I'll be ordering these for sure! I so want to do a proper RF-4EJ photo Phantom in that scheme with the Woodpecker on the tail. If only Tamiya had done the decent thing and issued a great 1/32 Photo Phantom kit. Got Wolfpack bits and Zotz Dragon decals lined up for the gun-toting EJ. It's a much better kit than the F-4E Early Production boxing, with sticky foil "fishplates" doublers for the stabs, a much more accurate rear IP and lovely grey as well as ghastly clear nose parts. Will be definitely ordering a couple sets of these decals. Has anyone heard from Wolf Pack on releasing their F-4EJ Kai conversion set again? So far as converting it goes, you can source the wingtip sensors from an extra set of outer wings of a revell f-4e/f/g (graft onto a hard [non-slatted] wing). Tail sensors look to be easy to add. Ribbing on radome should be easy enough to add, and then the only other external differences are a large spine antenna and larger antenna in the nose gear door. New control panels and HUD will round out the conversion if you’re hellbent on full accuracy. It looks like DXM is going to add the sheets for sale on dec 4 (Tuesday this week) if I read things correctly. Or you could make a request in the Traders Board..? Now available on Lucky Model.